Initiated in the 1950s, the Postmark Museum was the dream of PMCC member Margie Pfund of Columbiana, OH, and the Rev. Walter Smith of Bath, Maine. Rev. Smith was also the first director of the Post Mark Collectors Club. Margie Pfund supplied space, time and much of her own collection to start the project. She founded the first Museum by housing pieces in a small upstairs room of her home. It was dedicated at the first PMCC national convention in August 1962. 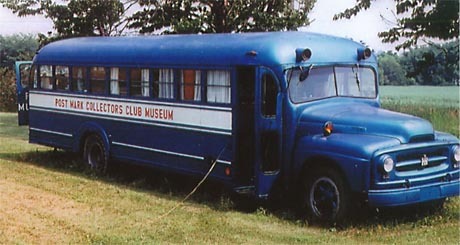 It subsequently moved to Herb Harrington's home in Niles, Ohio, for a few years, before the Club purchased an old school bus in 1969 (see above) for the Museum's home. The bus was renovated, painted blue and white, and parked at the home of Bernice Mittower, who became curator. One of the hopes was to drive the bus to the annual conventions, but practical concerns such as the lack of air conditioning, security and insurance, prevented that from happening. However, there have been four conventions, including the first, which have included a visit to the Museum as part of the festivities. 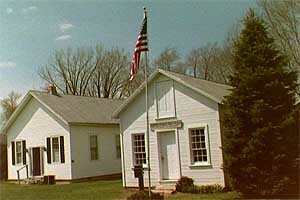 As the collection continued to expand, the Groton Township Hall, from Erie County, Ohio, was moved to Historic Lyme Village and placed next to the Lyme Post Office Building. In 1993, this became the Research Center and Library, while the post office building continued as the museum exhibit location. Within ten years, as the Museum outgrew its two small buildings, plans were made to build an entirely new building. 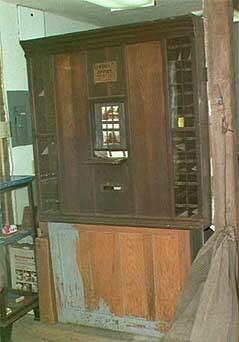 This was attached to Historic Lyme Village's new visitor center, and dedicated Oct. 23, 2003. The material donated to the Museum over the years by PMCC members and others figures to be the world's largest and most extensive known single postmark collection. One of the larger acquisitions was in 1975, when the Willett-Thompson collection was given by Mrs. Lawrence Willett of Ottawa, Canada, in accordance with the wishes of her late husband. Mr. Lawrence Willett, a PMCC veteran who collected postmarks for 30 years, purchased a majority of the collection of the late Dr. Howard K. Thompson, a Massachusetts resident and veteran PMCC member. In the early days, Dr. Thompson helped Margie Pfund launch the PMCC Museum. The entire collection is now mounted on acid free paper, protected in archival quality mylar sleeves, and held in over 300 large binders. Completed and still maintained by volunteers from the club, more than 7,000 hours have been devoted to this project. In 1987, the entire Willett-Thompson collection was placed on microfilm. More recently, it was scanned, and CDs or DVDs of the collection are available for purchase here. Images and descriptions of many of the museum's additional holdings can be found here. Because PMCC members feel the research library is an area of immense service to collectors and postal historians, they continually strive to add new material to further develop its quality. With the exception of the library, no material is purchased for the Museum. Financial support for the Museum is maintained by the membership of PMCC through individual donations, auctions in the club's monthly bulletin, the annual benefit auction held at each year's national convention, and the Mittower Building Fund. Bernice Mittower, a PMCC member for almost 35 years and a charter member of the Historic Lyme Village Association, was the curator and cornerstone of the Museum for over 25 years. The Mittower Fund was established to provide long term financial support for the Postmark museum. In tribute to Bernice Mittower's love and devotion to the Museum, the Fund was named in her honor. During 2003 the fund was used to build a new Museum building on the Lyme Village Grounds. See photos of the Museum's construction. Subsequently Vick Steward served as curator. Among his contributions, he was instrumental in promoting the PMCC Museum's Work Weeks. In 2007 long-time curator, Former Director of the PMCC, and friend Dave Proulx passed away. His wife Bev Proulx assumed the position of Curator, assisted by a wonderful volunteer staff of PMCC members. She handed the reins over to longtime PMCC member Gary Hendren in 2014. Each of the separate collections is receiving donations from many generous people. The process of cataloging and preserving these collections is conducted by volunteers from the PMCC, under the supervision of the museum curator, Gary Hendren. One project in the works is to build a digital post office photograph collection, in addition to the Museum's physical collection.